I hope you’re excited for this, because this involves everybody’s favourite dessert and that is “ice cream”. 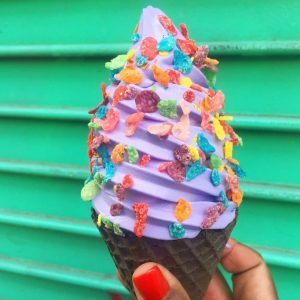 A new ice cream has been hitting social media because of its purple colour. Yeah it’s not everyday you see purple ice cream but it has been around for awhile from when I remembered. The difference in this one is made from a specific sweet potato that is of the colour purple inside. For many of us in the West, sweet potato has the organgy color, whereas in Asia such as the Philippines and China, their yams have a purplish colour. The yams that are used in many Asian countries are used mostly in dessert dishes. All sweet potatoes are known to have many nutrients and is jampacked with antioxidants helping us reduce the risk of heart disease and cancer. It is the same kind of antioxidants found in most berries. Doing more research, it seems the fad of taro or yam ice cream has been around for a couple years. If you look online there are many desert recipes you can find that uses taro. One simple recipe is making your own ice cream. 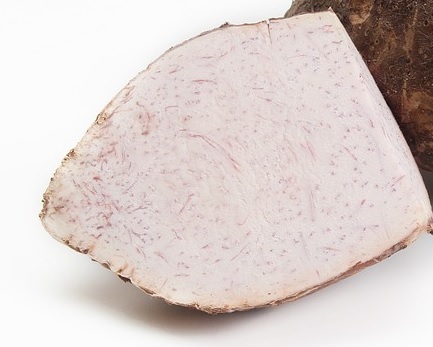 All you need a large taro root, a can of coconut milk(or cream) and finally sugar(half a cup to three quarters). Skin the root and grab a chopping board to slice it in cubes (1 inch sizes). Then steam the chunks until it gets to a soft consistency. Grab the coconut milk and put it in a pot or saucepan along with the soft Taro chunks and the sugar. Bring it to a boil and make sure you are stirring it. Take it off the stove top and let it sit for 20 minutes at room temperature. Next thing you may need is a food processor to help further puree the mix. Then grab your favourite ice cream maker and use the puree mix in the maker. One note is that if you use cream instead of coconut milk, it may give you a less grainy texture caused by the yam because it is thicker than that of the coconut milk. If you’re going use cream try to buy the grass fed version.